Question 1: What will be output of below sample program? Explanation:- In first SOP int is cast into byte (narrowing primitive conversion).Since java represents negative integer in 2's complement form, so all 32 bits for -1 is 1. When it is narrowed down to byte only 8 bits are preserved other bits are discarded, original value -1 is still preserved(sign indicating bits are discarded). Refer following diagram. Sign extension is performed if the type of the original value is signed; zero extension if it is a char, regardless of the type to which it is being converted. Similarly, in third SOP a char is converted into signed integer and zero extension is performed.Value of integer is retained as 65535. Question 2: What will be output of below sample program? An int value(i) is assigned to short(x) and it may cause possible loss of precision, so compilation error reported. Now lets comment line # 9 and again execute the above sample program. Explanation:- 123456 is converted into -7616 because compound assignment expressions automatically cast the result of the computation they perform to the type of the variable on their left-hand side. Here 123456 value is cast into byte and higher order bits truncated and since leftmost bit is 1 so it indicates negative number -7616. Question 3: What will be output of below sample program? Hint:- a char is an unsigned 16-bit primitive integer. Explanation:- Class PrintStream has overloaded version of println() method which takes argument of type String, char, int, float, etc and display string representation of the same. In first SOP D is treated as String and displays D. Similarly, in second SOP two strings are concatenated and displayed as DI. In third SOP, a char is argument of function println(), it prints a character and then terminate the line. What about 4th SOP, their is an expression with + operator and none of the operand is String. So + operator will try to evaluate the given expression and char is promoted to int type. 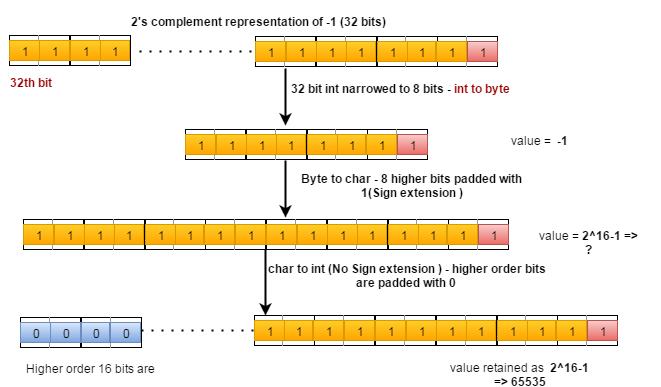 Conversion of unsigned int(char) to int allows zero padding in higher order bits. (16 bit char to 32 bit int with higher order padded with 0). D -> 68 and I-> 73 => 68+73= 141. Question 4. What will be output of below sample program? Explanation:- Java does not support operator overloading except when + is used with Strings, + operator can be used as concatenation operator(String conversion on both of its operands and then to concatenate the resulting strings). Function println() calls internally toString() method and represent its argument as String and if expression inside println() starts with a string then + operator will append followed elements to the starting string. taking consideration of all above concept, lets see each SOP. In first SOP, expression starts with string so + operator act as concatenation operator. It will treat followed 2+2 as string rather than int. In second SOP, expression starts with string and its followed + act as concatenation operator. However, followed 2+2 is inside ( ) so first 2+2 is evaluated followed by it is concatenated with previous string. Similarly, in third SOP, statement starts with an empty string so followed chars are appended with this empty string "". In fourth SOP, Since expression starts with a char not a string so + operator will not act as concatenation operator. It will try to add both char type and chars are promoted to int. (See previous question for more detail). First sum is computed and followed by string is appended. Question 5. What will be output of below sample program? Explanation:- As mentioned earlier + operator can be used as concatenation operator(String conversion on both of its operands and then to concatenate the resulting strings). Output of 1st SOP is expected, println() prints string representation of char array. Similarly, in 3rd SOP to.String() of chArr is used so result would be same as above. Finally, we get intended result in 4th SOP, String.valueOf() explicitly convert the array to a string before concatenation.